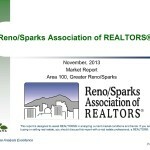 The Reno/Sparks Association of Realtors came out with the November 2013 market stats. The median sales price went up again to $224,900. A 4.7% increase compared to October. Up 24.3% compared to the same time last year. This isn’t exclusive to regular sales (up 7.6%) as REOs went up 9.9% and short sales were up 8.3%. Number of units sold was down 14% compared to last month. Typical of this time of year and the high list prices sellers are putting out. Average days on market was up 8.9% to 105. Short sales average 226 days, regular sales 76, and REOs 114. Months supply of inventory crept up to 4.1 months. Still a seller’s market. Posted in For Buyers, For Sellers, Market Update and tagged price increases in reno real estate, reno real estate agent/broker for seller, reno real estate market information, reno real estate stats. ← How Many Cash Transactions In Reno/Sparks?